Shooting in low light is one of the more vexing photographic challenges. The best solution is often to turn off your camera’s electronic flash and use what little existing light you have. But this isn’t always practical—especially in situations where your subject is moving or where you don't have a way to stabilize your camera. In these cases, you'll probably need the help of your flash. Here’s how to make the most of what you have. When your camera is in automatic mode, the flash goes on any time the lights dim. But that doesn’t mean you’re doomed to “deer in the headlight” snapshots. Nearly every camera has flash exposure compensation, which lets you tone down the burst of light that typically causes over-exposed subjects. To use this feature, look for a flash exposure compensation setting, or for icons that indicate it, such as +/- (flash). You most likely will be greeted with a scale that has 0 in the center with -1 and -2 to the left, and +1 and +2 to the right. Moving the marker to -1 means that the flash will use one f/stop less than usual. The results are often a more natural appearing photograph—so much so, that sometimes you can’t even tell that the flash went off. Photojournalist Steve Makris uses a sheet of white paper as an improvised light diffuser. For a Hot-Shoe Flash: Let’s say you have your hot shoe flash attached to your SLR, but its light is too harsh. 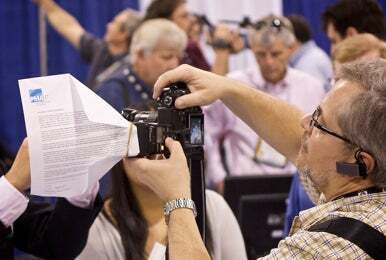 Do what photojournalist Steve Makris does on location: fold a white sheet of 8.5-by-11-inch paper at two corners and attach it to the flash with a rubber band. Instead of pointing the flash directly at the subject, angle it upward. When you make an exposure, the light bounces off the large sheet of paper creating a nice diffused effect. For the Built-In Flash: If a hot shoe flash is too much to lug around, you might be interested in Gary Fong’s Puffer pop-up flash diffuser. It works with most DSLR pop-up flashes by mounting in the hot shoe and positioning a translucent dome in front of the flash. It’s not as effective as diffusing a shoe mount unit, but it does help considerably and will cost you only $20. For Compact Cameras: What about those of you with compact cameras? I’ve had pretty good luck holding a translucent film canister over the flash head. Position the open end of the film canister so the flash bursts into it. It softens shadows a bit, and even warms up the light. This works best for closeup photography. It’s not perfect, but the price is right.